The 1993 Nobel Prize in Physiology and medicine was awarded to Richard Roberts and Phillip Sharp for their work on split genes and RNA splicing, one of the fundamental mechanisms involved in protein diversity and evolution. In 1972, Richard Robert started fundamental work on gene regulation and structure in the Adenovirus which ultimately led to the discovery of gene splicing in 1977. Quite remarkably, Richard Roberts and Phillip Sharp both independently, at the same time and with the same model organism and techniques stumbled upon the slip gene theory: some of the genetic information is spliced out of RNA before it is translated into proteins. In eukaryotic cells the DNA is transcribed into mRNA in the nucleus. From the nucleus, the mRNA is selectively transported into the cytoplasm where it is translated into proteins. This compartmentalisation of the transcription process permits a more extensive processing of the genes than in procaryotes. When Roberts and Sharp compared the mRNA in the nucleus and the mRNA in the cytoplasm, they were different. And when they compared the cytoplasmic RNA segments to the DNA segments they came from – by creating RNA-DNA hybrids - they didn’t match perfectly. Some regions corresponded, whereas others just seemed to have disappeared in the case of cytoplasmic mRNA. Previous work suggested that during the processing of mRNA, several nucleotide regions are spliced out, these are called introns. Other regions are spliced together to form the protein-coding transcripts, this mRNA is known as an exon. Work using mutations identified ‘consensus sequences’ in the mRNA , sequences at the recognition, cutting and splicing points in the mRNA limiting the introns and exons and responsible for the splicing. The same sequences were found in mammals, yeasts and plants. Such a high level of conservation dates back the translation process by billions of years to the origins of the eukaryotic cell. 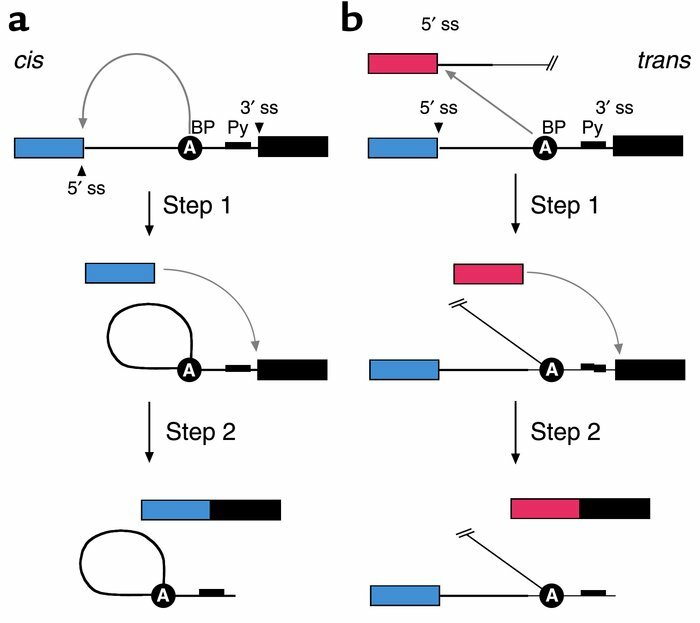 Splicing can occur with or without the help of a spliceosome (a large and complex molecular machine) and different types of splicing – cis or trans – have been identified in trypanosomes, C.elegans and vertebrates. Split genes are very common in genomes for two good reasons. First it is really easy for new combinations to come about that can create new genes or proteins by duplicating exons. For example, an exon containing an active domain of an enzyme can be duplicated and moved and associated with an equally important function of another exon, creating a whole new protein - a bit like building blocks. Secondly, a gene can also encode for multiple proteins in that way. If a gene contains 8 exons for example, it can just as well make a protein by sticking together exon 1, 4 and 6 or associating exons 2,4,6 and 7. Two completely different proteins will come out of each combination. This is one explanation why there is no direct correlation between gene and protein diversity.